Patents are tools to protect commercial interests and investments, but as the Golden Rice example shows, they are not an impediment to the use and dissemination of a technology. Apart from being national in scope and limited in time, their owners can decide to whom to license and under what conditions. Notwithstanding the fact that a number of patented technologies were involved in the production of Golden Rice (Kryder et al. 2000), Syngenta Seeds AG was able to negotiate access to all pieces of the puzzle actively necessary for the intended humanitarian purposes, providing the Golden Rice Humanitarian Board with the right to sublicense breeding institutions in developing countries free of charge. The patented key technology for Golden Rice production, invented by Prof emeritus Ingo Potrykus, of ETH-Zurich and Prof Peter Beyer, of the Univ of Freiburg, provided access to a package of ancillary technologies required to engineer the trait into rice. A license to those technologies was obtained from Syngenta. The package contained proprietary technologies belonging not only to Syngenta but also to Bayer AG, Monsanto Co, Orynova BV, and Zeneca Mogen BV.These companies provided access to the required technologies free of charge, for humanitarian purposes. Eliminating reach-through rights and technologies that don't show up in the most recently developed Golden Rice versions leaves us with only a few patented technologies, all of which have been made available for humanitarian purposes free of charge. The licensing process was quick and simple, contrary to what many onlookers believe. Similar projects are looking at this licensing agreement as a good example of how this kind of arrangements between the public and the private sector can be made, especially for humanitarian purposes. 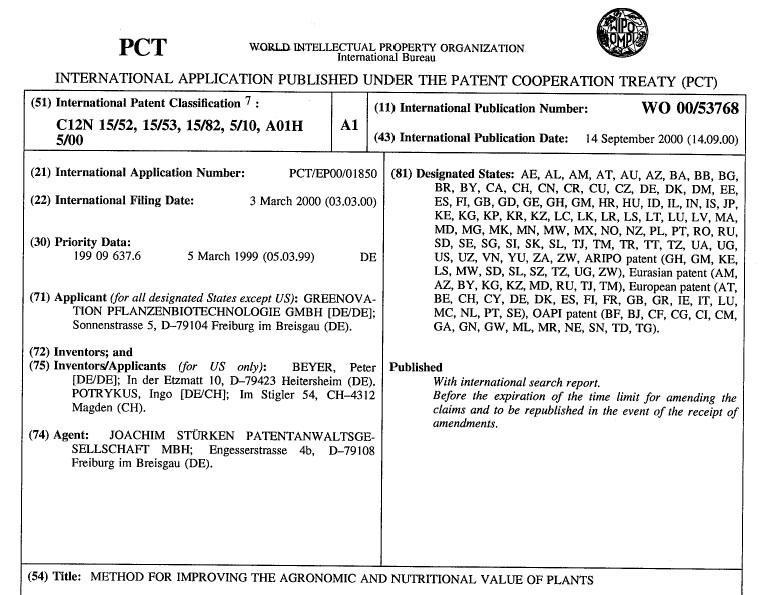 The heading of the PCT patent application representing the IP cornerstone of the Golden Rice Project. This one patent opened the door to a larger technology package. Independent claims of Australian patent AU 776160 B2 issued to the Golden Rice inventors Ingo Potrykus and Peter Beyer. Independent claims define the scope of the patent in the broadest terms. selecting transformed plant material that comprises the cells that accumulate carotenoids. (b) an expression cassette capable of directing production in said cells of a phytoene desaturase derived from a bacteria. Universities are not set up to develop products. From the onset of the Golden Rice Project it was clear that in case of success during the research phase, a product should be developed, and that the product had to reach vitamin A-deficient people in developing countries. That means, it had to be a humanitarian project. Industries are set up to develop products. Thus, an industrial partner was sought that would agree to the humanitarian purpose of the project. Such a partner was found with Syngenta, an agrichemicals and seeds company with headquarters in Switzerland. Syngenta was instrumental in converting the proof-of-concept results generated at the University of Freiburg and ETH Zurich into deliverable products. This contribution was based on the understanding that Syngenta would retain commercial exclusivity for the technology, including large agricultural setups in developing countries. In 2005 Syngenta decided not to go commercial with Golden Rice in developed countries, a main reason being that there is practically no vitamin A deficiency in such countries. Thus, it would be probably a vitamin-enriched product with little commercial interest, even though antioxidants are very fashionable, and provitamin A is such an antioxidant. But still, Syngenta continues to support the project with advice and scientific knowhow. The inventors have assigned their exclusive rights to the Golden Rice technology to Syngenta. Syngenta added some further technologies, and arranged licences with other companies for some additional technologies to be included in the original Golden Rice. Syngenta, in turn, has given the inventors a humanitarian licence with the right to sublicense public research institutions and low-income farmers in developing countries, to the full set of necessary technologies. Syngenta retains commercial rights, although it has no plans to commercialize Golden Rice. The technology must be introduced into public germplasm ( = seed) only (see below). Regulatory imperative and national sovereignty, ie Golden Rice may not be released in a country lacking biosafety regulations, and the decision to adopt the technology is a national matter. No export allowed (except for research to other licensees): this is a humanitarian project, i.e. the seeds are meant to cover the daily requirements of the poor populations that are deficient in vitamin A.
Humanitarian Use of such improvements is guaranteed under the same terms of the original agreement (in this way any improvements to the technology will serve the humanitarian purpose). No warranties are given by licensor(s) (this is also related the fact that every receiving country will determine what biosafety and agronomic requirements to impose before approval of a Golden Rice variety. Liabilities and costs  each party is responsible for what it controls (this follows also from the fact that this is a humanitarian project and not a commercial enterprise). While countries adopting the technology are free to introduce the trait into their preferred varieties, there are some criteria on which strategic decisions for selection should be based. For example, receptor rice varieties should preferably be widely used by farmers. Those varieties should also be expected to maintain prominence over time and be grown by most productive farmers in vitamin A deficiency-prone regions (for local and regional supply). Kryder D, Kowalsi SP, Krattiger AF. 2000. 'The Intellectual and Technical Property Components of pro-Vitamin A Rice (Golden Rice™): A Preliminary Freedom-to-Operate Review', ISAAA Briefs No 20. ISAAA: Ithaca, NY. 56 p.
The need to obtain gene constructs and transgenic traits directly from multinational companies is often brought up and seen as a hindrance to the adoption of biotechnological crops by developing countries, and moreover, as unaffordable for small-scale farmers. There is no prima facie reason why the crop products of genetic engineering should only be available from company sources, which naturally wish to repay the investors in their creative research by profits. Public sector institutions and scientists can also create de novo products with the same tools. Developing countries can take advantage of the patent system itself. Patents are not international in scope. Most patents are sought only in a few developed countries, where the owner expects to conduct business based on the protected invention. Another aspect of patenting, is that they expire after 20 years. Many biotechnological inventions are coming off-patent now. Many gaps offer opportunities, especially in the case of what may be (internationally) called orphan crops (eg not mainstream internationally traded commodity crops) but which may be very important locally, or for crops which are not exported. And then, even if patents appear to be in place, was the protected invention enabled in the crop in question? If not, the patent may be invalid, which of course would be for the courts to decide. Why is the public sector not doing more to create and develop their own gene construct versions and new varieties? A significant issue is the anticipation of regulatory costs. In a curious paradox, the suspicion often caused by anti-globalisation activists against GMO crops (but not against GMO processed foods (eg cheese or beer) or medical applications (eg insulin and many new drugs) has reinforced an "environmentally justified" set of regulatory hurdles which only large companies can afford. So the anti-globalisation activists have "shot themselves in the foot", and the farmers and consumers who would benefit from those crops are the collateral victims. There is no scientific justification for these high regulatory costs. Both conventional and genetic engineering approaches to trait development involve the generation of genome alterations from which breeders then select useful varieties for further breeding, while simply rejecting any undesired line. All internationally credible science institutions have come to the same conclusion: there is no specific health or environmental risk from the techniques used in genetic engineering of crops compared to any other form of crop breeding. The use of this additional technology to extend the potential of earlier forms of plant breeding should not be denied, especially to the public sector in developing countries. Food security, both for macro and micronutrients, and the agriculture and health needs of the world's population must be considered with greater weight than unproven environmental suspicions. The agriculture and health communities must speak loudly to demand this. Countries with malnoursihed must make their voices heard, such that international treaties like the Convention on Biological Diversity at least take into account the benefits of biotechnology, leading to a less precautionary approach to so called "environmental concerns". Without change to these instruments, the public sector will continue to find the only route to access the now well demonstrated utility of the "new technology" is via the private sector,who normally will expect to be paid. In the case of Golden Rice, the technology originated in the public sector, and in a negotiated cross-licensing deal with the private sector, through division of access by market ('developing countries for defined humanitarian uses' to the inventors and their licensees, commercial exploitation rights to the company) it was possible to secure, free of charge for the public sector, regulatory support from the private sector and private sector improvements. There are many models for partnership, but one has to have clear objectives, and preferably more than money -for example some proprietary technology- to trade with. Alternatively, when faced with the uncertainties of analysis, courts, time etc it may be cheaper and less stressful and quicker to come to a commercial licensing agreement with a technology provider. But you need to know your options, to be able to evaluate the best route, and maybe to obtain a better deal through negotiation. 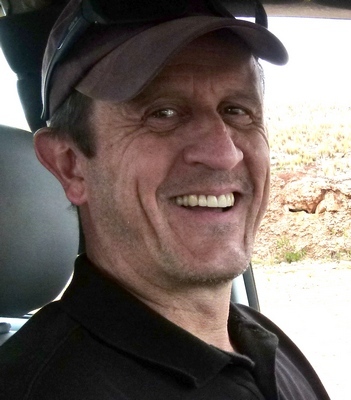 The seller also wants to sell, as already shown by examples of deals between international companies and local enterprises to develop locally adapted transgenic varieties of cotton or soybean. Let's hope that with increasing acceptance and the accumulated experience with GM crops, more and more developing countries will find ways to benefit from the many new traits in the pipeline in the near future.